Chef/Owners of Black Restaurant Group, Barbara and Jeff Black have teamed up with Children’s National Medical Center and Dr. Fran Cogen, MD to raise money for children who suffer from diabetes as their son Simon has juvenile diabetes. Black Restaurant Group has set a goal to raise $200,000 to build a new state of the art kitchen that is part of a $5 million expansion at Children’s National Medical Center to support children with diabetes. 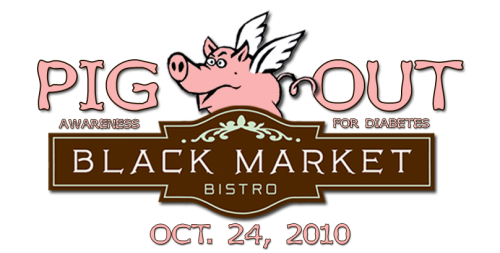 The first event is Pig Out for Diabetes on 10/24/10 at Black Market Bistro. The Pig Out will feature a BBQ Competition and Black Market Bistro will be serving up lots of other great BBQ/picnic items and of course there will be live music and fun activities for the kids. Tickets are $45 in advance and include all you can eat and drink! Sounds awesome. I love giving away tickets and this one sounds especially fun. To win the tickets simply leave a comment telling me what is your favorite type of bbq? I’ll announce the winner Friday. Thanks to the Black Restaurant Group for giving PoP readers this opportunity.